Funeral Services for Don Ebbinga were held at Immaculate Heart of Mary Church in Currie, MN at 10:30 a.m. on Monday, November 12, 2018 with Msgr. R. Paul Heiting officiating. The organist was Patty LeClaire. The song leader was LoAnn Hansen. The pallbearers were his grandchildren. Interment was at Calvary Cemetery in Currie, MN. 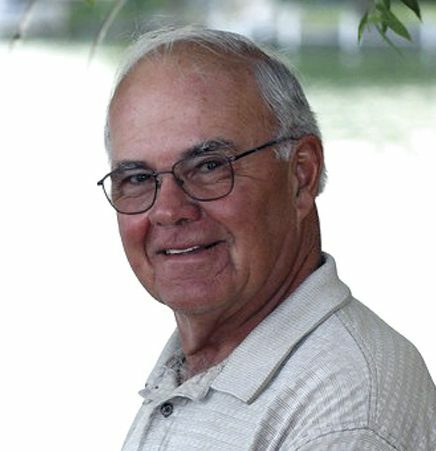 Donald Dedrich Ebbinga was born on July 25, 1936 on the family farm near Avoca, Minnesota to Dedrik and Anna Theis Ebbinga. The family later moved to White, SD where Don attended school. At a young age, Don went to work as a hired hand for area farmers. He learned his carpentry skills from his dad, and working with local carpenters. Don enlisted in the United States Air Force on June 8, 1954 he completed basic training at Lackland Air Force Base and was stationed in Alberta, Canada and Chandler, MN. He was honorably discharged on June 7, 1962. On August 10, 1957 he and Arlene Rieman were married at St. Columba Church in Iona, MN. Following their marriage, they made their home in Iona and raised their six children and Don’s youngest brother, Steve. Don was a carpenter for Iona Lumber and repaired radios and televisions on the side. In 1971, when Iona Lumber turned their focus toward farm buildings, Don quit his job to follow his passion for building homes and started his own business, Ebbinga Construction. He also owned a NAPA franchise and enjoyed hobby farming. In 1986 he took a position with UBC in Slayton and dissolved Ebbinga Construction. He and Arlene moved to a home on Lake Shetek. Don retired in 1998 and stayed busy as a neighborhood caretaker and handyman. His favorite job was riding his John Deere tending to 19 lawns. Arlene passed away on October 29, 2012. Don spent the last 4 years with his special friend, Donna Bertrand. Don passed away at his home surrounded by his family on November 7, 2018 at the age of 82. He was a member of Immaculate Heart of Mary Church in Currie, MN and St. Anthony of Padua Catholic Church in Casa Grande, AZ. Don served on the St. Columba Church Board, the Iona City Council, the Iona Volunteer Fire Department and was a County Zoning Commissioner. He was a member of the Horseshoe Clubs in Balaton, Canby, Currie, Marshall, Tracy, MN, and Casa Grande, AZ. Horseshoe pitching took Don all over the country to attend the World Horseshoe Championship. Don enjoyed traveling, woodworking, dancing, music, theater productions, bowling and golf. In his retirement, his favorite places to be were “putzing” in his garage, enjoying the lake, enjoying the sun on his face at his Arizona home and most importantly on the seat of his John Deere mowing lawns. Survivors include his six children and their spouses, Kim and Doug Hagemeyer of Blaine, MN, Julie and John “Skinny” Luedeman of Sibley, IA, Mary Jo and Jim Mortland of Marshall, MN, Diane and Troy Diedrich, of North Mankato, MN, Karen and Dave Wagley of Brandon, SD and Alan and Kristi Ebbinga of Lake Crystal, MN, 17 grandchildren, Scott and Laura Hagemeyer, Ryan and Sarah Hagemeyer, Ashley and Brad Fischer, Chelsea and Michael Hodapp, Jenna Luedeman and Kyle Miller, James and Tara Mortland, Jenny and Royce Tuffs, Malia Mortland, Zach Mortland, Courtney Diedrich, Grant and Megan Diedrich, Andrew Diedrich, Jordan Wagley, Nicholas Wagley, Natalie Wagley, Allyson Ebbinga, and Kyle Ebbinga, 14 great grandchildren, Emma and Audrey Hagemeyer, Copper and Tenley Fischer, Camden and Brixton Hodapp, Abigail, Felicity, Gemma and Charlotte Mortland, Riley, Jessica, and Melanie Tufts, and Liam Hutchinson, seven siblings and their spouses, Richard and Jeanette Ebbinga of Arkansaw, WI, Robert and Mary Ebbenga of Miltona, MN, John and Mary Ann Ebbinga of Tracy, CA, Ted and Sandy Ebbinga of Winlock, WA, Bill and Linda Ebbinga of Griswold, IA, Sandra Vernland of Volga, SD and Steve and Sharon Ebbinga of Prescott, AZ, his cousin, Jim Theis of Santa Ana, CA, who was like another brother, countless nieces, nephews, cousins friends and special friend, Donna Bertrand of Slayton, MN. He is preceded in death by his parents, wife, Arlene, brother, James Ebbinga, and sisters, Linda Fryer and Sharon Filzen. In lieu of flowers, memorials may be directed to Murray County Hospice or the Pancreatic Cancer Action Network. Totzke Funeral Home of Slayton is entrusted with arrangements.